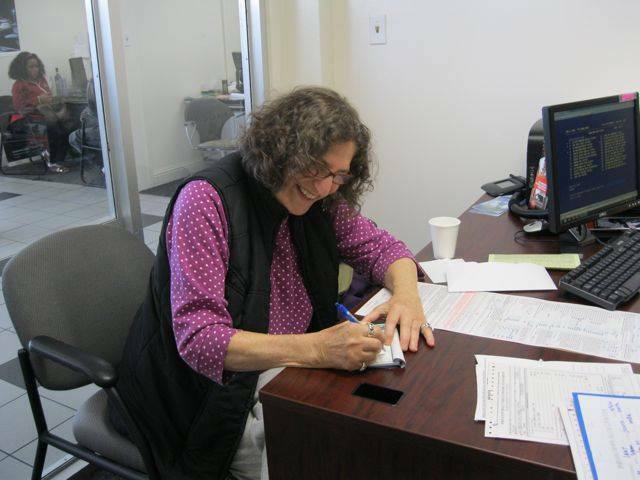 Car Pal client signs her paperwork at a Subaru dealership in Berkeley, CA. What do you need to do just before your sign your final paperwork for your next new or used vehicle? Here at Car Pal, we get a lot of questions about the signing process for new, used, and leased vehicles. Here are seven things to remember. If you have arranged a trade-in and you own the vehicle you are trading in (i.e., there is no lienholder), be sure to bring the title if you have it. If you can’t find the title, don’t panic! For a small fee, the dealership will apply on your behalf for a replacement title. If you are transferring your license plate, make sure you have your current registration available, as well as the plate itself. If you are financing and plan to make a down payment, find out in advance how much the dealership will allow you to put on your credit card. Most dealerships limit the amount to $3000, but it does vary. If you don’t want to use a credit card, make sure the dealership accepts a personal check. Then remember to bring your checkbook! Whether the vehicle you are purchasing is new or used, and whether Car Pal has already vetted the vehicle for you or not, do a thorough pre-purchase inspection! For your own peace of mind, check everything on the list below. Checking the mechanical items is less urgent if it’s a new vehicle, because those will still be under full manufacturer bumper-to-bumper warranty for at least another three years or 36,000 miles. However, on a pre-owned vehicle, particularly one that is out of warranty, it will not be advantageous to you to notice that something is not working as expected after you get home or after the dealership delivery team leaves, if they’ve delivered the vehicle to you. If you are trading in a vehicle, you’ve likely emptied it in advance. Now is a great time to check the car again to see what might be tucked away in there. Sunglasses? Garage door opener? Pet safety harness? Also, check the CD player. Even the CEO of Car Pal left a favorite CD in her last Subaru trade-in. While she did remember to ask the dealership to send it back, and they agreed, she didn’t remember to follow up (a common occurrence for many of us in our busy lives), so she never did get that CD back. Check the vehicle’s odometer. A few extra miles over what you expected is fine; someone may have driven the car to the gas station to fill your gas tank. But if there is a large discrepancy between what is on the odometer at time of purchase vs. what you anticipated, now is the time to address that. Two keys and two remotes. For brand new cars: The best time to catch a scratch or ding on your vehicle is before you purchase it. Once you’ve taken it home, even if it happened prior to your taking possession, the dealer could claim it happened after you left the dealership. If you’re buying a pre-owned vehicle, unless it is a pre-owned high-line, it isn’t going to be perfect. You’ll know in advance what its flaws are if you’ve done your homework (or we’ve done ours…), and you’ll be expecting those. However, this is the most vital moment to re-inspect. If you suddenly find that the front bumper is out of alignment (this has happened! ), bring it to your salesperson’s attention immediately. If you are using Car Pal, call us immediately as well! It is important to resolve these kinds of issues before you officially take possession of the vehicle. Questions? We’re glad to help! Send an email to slindsaygraham@yahoo.com or call us at 336-601-6390.